Dimensions: Base 4 3/4" square. Shade 14" x 12" . 29" high. Dimensions: Base - 4 3/4" square. 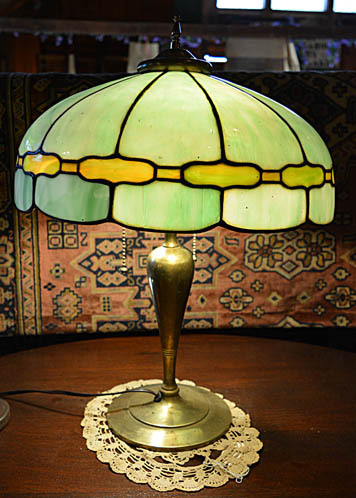 Lamp - 4 1/4" square x 9" high. Total - 15" high. 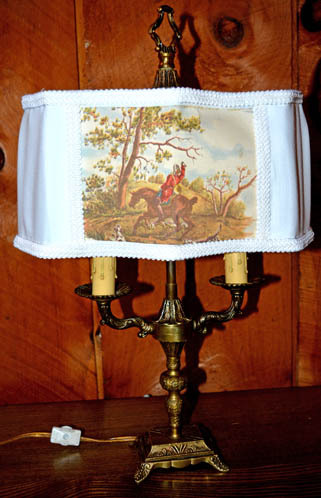 Dimensions: Base 11" x 62 1/2" high. Dimensions: Shade 6". 15" high . Base 5". Dimensions: Base 4" wide x 3" deep. Shade 12" wide x 7" deep. 18" high. Dimensions: 5 1/2" round x 14" high. Dimensions: 5 1/2" wide (with handle) x 4 1/2" deep x 13" high. 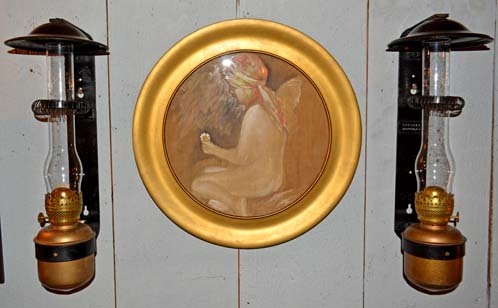 Description: Here is a useful and decorative piece - a Bradley & Hubbard Brass Oil Lamp. Dimensions: Base - 6" round. 24" high. Dimensions: 7" wide x 8 1/4" deep x 20" hogh. Dimensions: Base - 7 1/2" round . Shade - 16" x 24" high. Dimensions: 16" wide x 17" high. 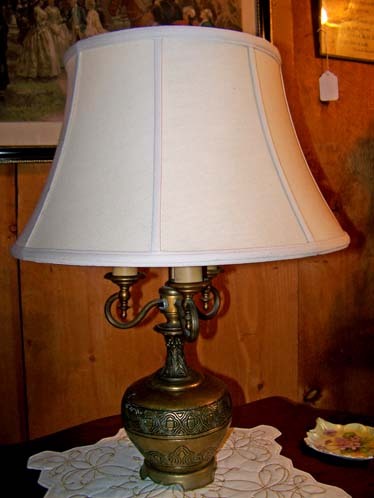 Description: This is an authentic brass hanging lamp from the 1920s to 1930s. 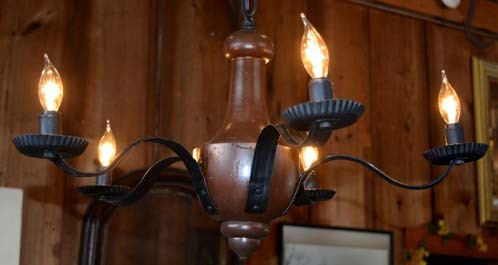 We have professionally restored this fixture by burnishing the brass and re-wiring for safety. 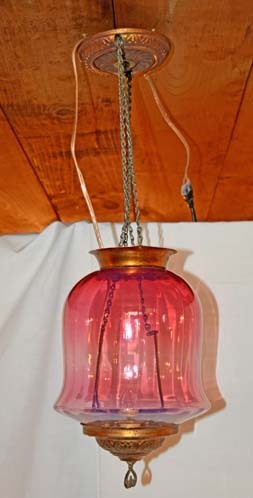 Dimensions: 23" round x 39" high, including chain. Dimensions: 12" wide x 34" high. 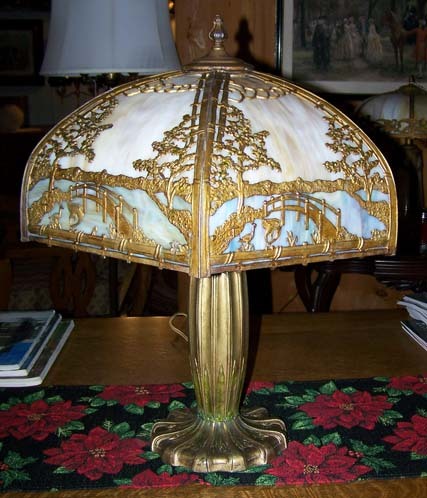 Description: Here is a truly gorgeous Jumbo Gone With the Wind Lamp manufactured by the Plume & Atwood Co., circa 1890. Dimensions: 12" round x 28" high. 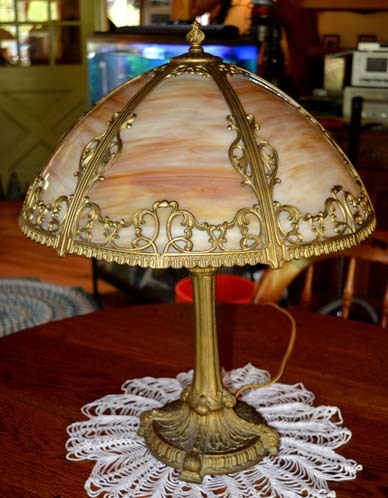 Description: Here is a beautiful lamp from the 1850s that has been electrified. 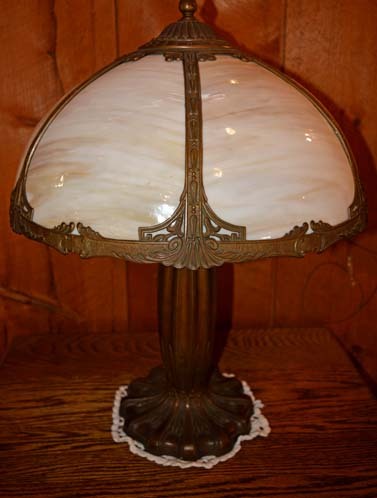 The top ball and the base of the lamp are hand painted for a perfect match, and they are in pristine condition. Dimensions: 9" x 23" high. 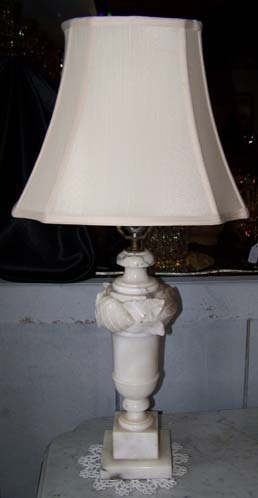 Description: Here is a classic example of the original Gone with the Wind Lamp that got its name from the movie. 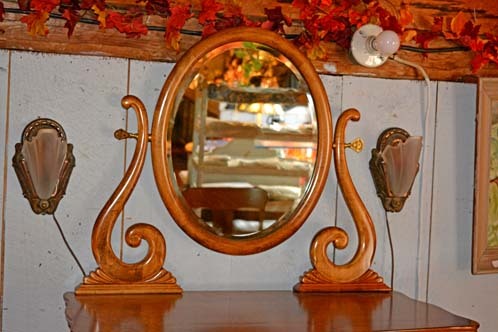 Dimensions: 7 1/2" round x 21" high. Dimensions: 22" round x 12" high. Dimensions: 6" round x 20 1/4" high. 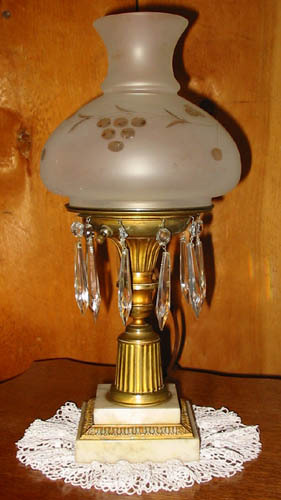 Description: Here is a Large Clear Glass Kero Lamp in great shape and useable condition. Dimensions: Base 7" round. 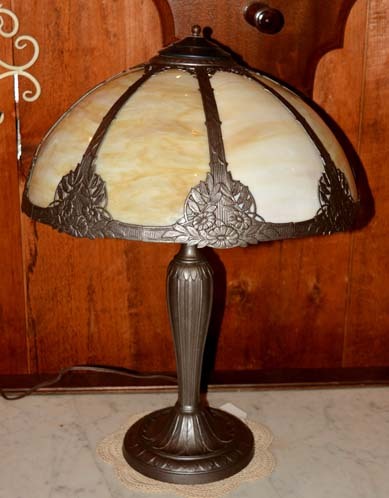 Shade 16" round. 24" high. Dimensions: Base 5" round. Shade 8" round. 13 1/2" high. 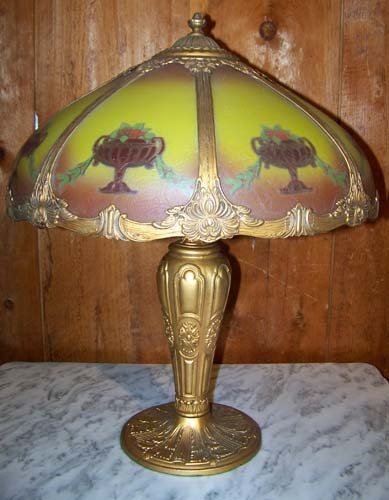 Description: This signed Moe Bridges Boudoir Lamp was produced in the 1920s. Dimensions: Base 6" . round. Shade 4 1/4" square. 13 1/4" high. Dimensions: 6" wide x 6" deep x 9" high. 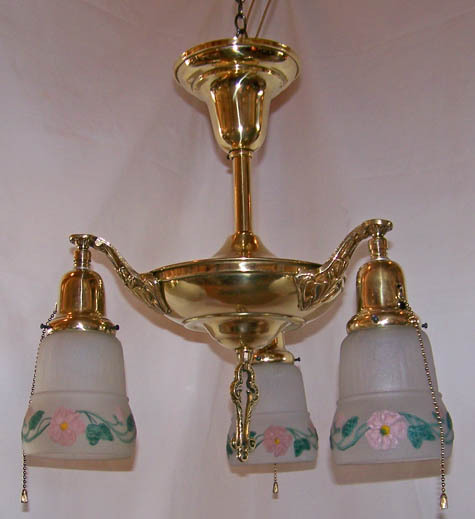 Dimensions: Base - 8 1/2" round. 24" high. 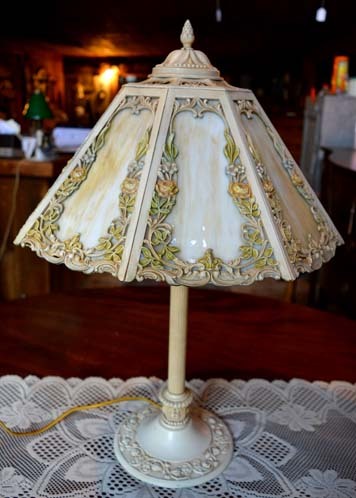 Description: This Reverse Painted Lamp is a beauty! Dimensions: Base 8" round. 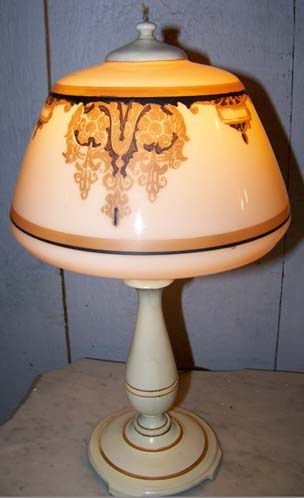 Shade 19" round. Total height 23". Dimensions: Base 7" round. Shade 17" round. 22" high. 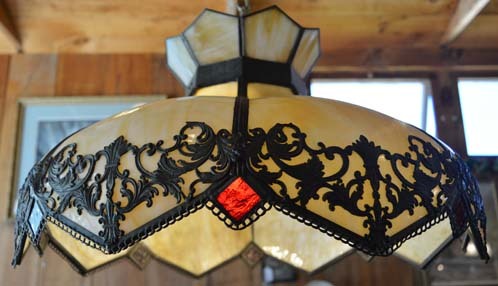 Dimensions: Base - 7 1/2" round. Shade - 16 1/2" round. 22" high. 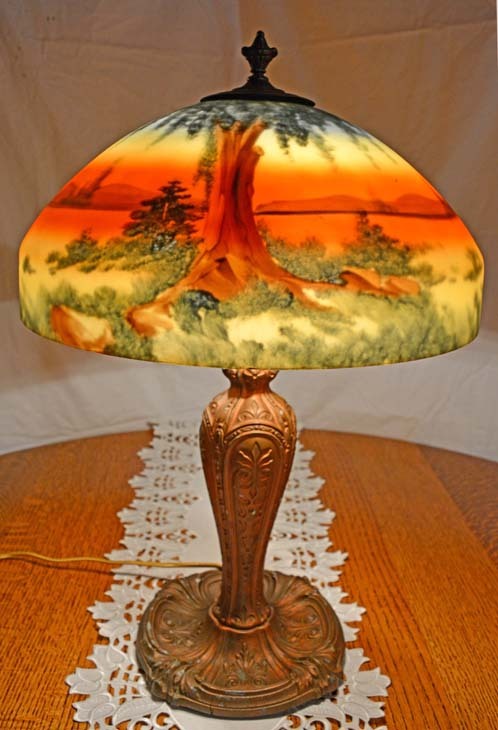 Description: This Slag Glass Table Lamp is a beauty! Dimensions: Base 7" round. 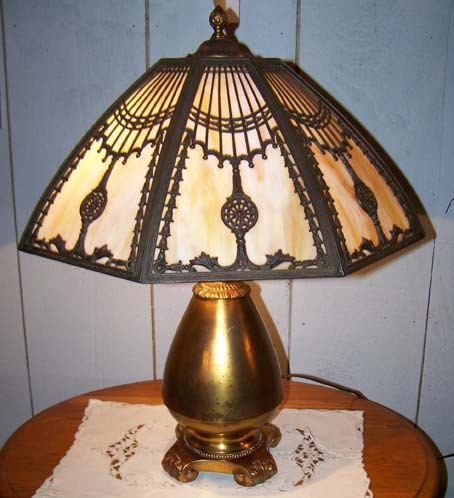 Shade 15" round. 20" high. Dimensions: Base 11" round. Shade 15" round. 60 1/2" high. Dimensions: Base 4 3/4" square. Globe 8" round. Total height 17 1/2" high. 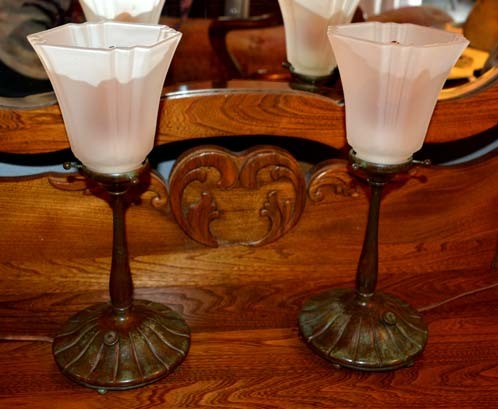 Description: Here is a touch of class from days gone by. 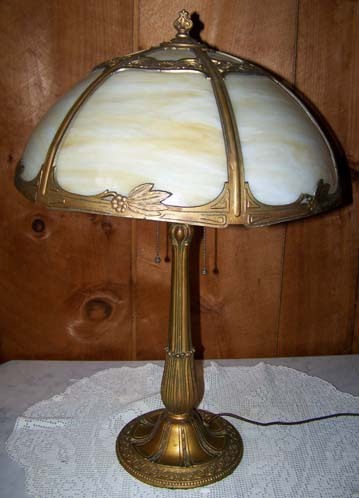 This is a beautiful marble base lamp with brass design and adorned with Victorian glass prisms. Dimensions: Base 8". Shade 17". 22" high. Dimensions: Base 8" square. Shade 12" wide x 9 3/4" deep. 62" high.